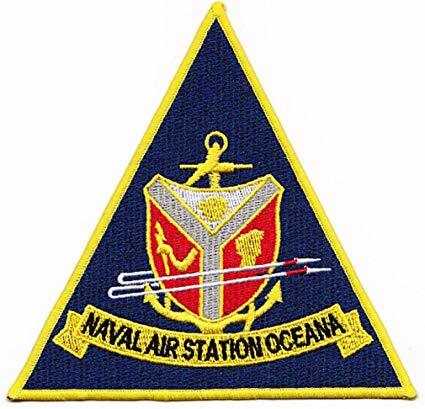 Naval Air Station Oceana is located in Virginia Beach, Virginia and is part of the region Navy people commonly refer to as Hampton Roads. The air station is what the installation’s official site describes as a “Shore-Based Readiness Integrator”. NAS Oceana is the Navy’s east coast home for F/A-18 Hornet and Super Hornet fighter jets with 18 squadrons in all. A majority of those planes are deployed on aircraft carriers, but two are permanently assigned squadrons. Find information about Naval Air Station Oceana, including the main commercial and DSN numbers for the base, information on basic services, base transportation, lodging for TDY and PSCing personnel, and inprocessing. Tha NAS Oceana mission includes providing support for the Navy Atlantic and Pacific Fleet Force of “Strike Fighter Aircraft Joint/Inter-Agency Operations”. It also trains and deploys strike-fighter squadrons. There are the previously mentioned squadrons of F/A-18 Hornets, but also two H-3 Sea King helicopters used for search-and-rescue missions. The installation employs more than 10 thousand active duty Navy troops and approximately 4,500 civilians. Naval Air Station Oceana was, once upon a time, nothing but what the Navy official site describes as a “swampy wasteland”. In 1940 the government purchased more than 300 acres of land, built a small airfield, and was considered a completed project in 1941, just in time to be used as support for the American World War Two effort. The original staffing for the base was limited to under 200 enlisted and around 30 officers. But as the war intensified, so did the need for this east coast operation, and in 1943 efforts to extend runways, boost the enlisted compliment to approximately 800, and significantly increase the number of aircraft and missions. The war ended, and by the 1950s it was clear that what was known back then as Naval Auxiliary Station Oceana needed to be redesignated; it had far outgrown its original designation and when it was re-christened as a Naval Air Station, it was just in time to embrace an up-and-coming new mission for the United States military; fighter jet operations. In the 1950s when military jet aircraft was still considered new technology, no one could predict how involved NAS Oceana would be in this new kind of plane. But over the years NAS Oceana has flown or supported a diverse range of airframes including the A-4 Skyhawk, F-4 Phantom II, and the A-6 Intruder. 1974 saw the addition of F-14 Tomcats to the Oceana mission, and in the late 90’s the first F/A-18 Hornets arrived. The NAS Oceana mission in the 21st century includes those 18 F/A -18 Hornet squadrons, and the Oceana Center for Naval Aviation Technical Training. Today, the Naval Air Station is well over 5,000 acres-a large increase from those original 300+ acres purchased at the very beginning of the NAS Oceana story in the Hampton Roads area. There is plenty to see and do in the Virginia Beach area, which is strategically located where Chesapeake Bay intersects with the Atlantic Ocean. That area features a long boardwalk (approximately three miles long) along the ocean, and there is also First Landing State Park which commemorates the arrival of the first Jamestown colonists in the early 1600s. This area is also known for the Virginia Aquarium & Marine Science Center. Attractions in the area include The Adventure Park at Virginia Aquarium, Rudee Inlet paddle boat tours, indoor skydiving with iFLY Virginia Beach, and military buffs should explore the Naval Aviation Monument that features sculptures that represent a variety of phases in military aviation history. Tarnished Truth Distilling Company is sure to please those who enjoy craft brewing, and animal lovers should explore the large number of horseback tours and other riding opportunities in the area such as Virginia Beach Horseback or Corolla Outback Adventures Wild Horse Tour from Virginia Beach. The Hampton Roads area has no shortage of indoor and outdoor-based fun. Newly arriving permanent party military are directed to check in at Building 230 (the Quarterdeck) where PCS orders are endorsed 24/7. After the initial check-in, new arrivals will in-process at the Personnel Support Detachment which is open during normal duty hours. There may be additional check-in requirements depending on the service member’s gaining unit policies. Some check-in requirements will vary depending on whether the gaining unit is currently deployed or not. The base is served by Oceana Branch Medical Clinic but is not equipped to handle emergency cases. Those in need of a more full range of medical services will likely use Charette Health Center, Portsmouth for emergency, outpatient and inpatient health care needs. TRICARE users enrolled in TRICARE Standard/Extra will find many area hospitals and specialty clinics. Make an appointment by calling 866-MIL-HLTH or 866-645-4584. NAS Oceana is served by the Child Development Center (CDC) which offers full-time care for children six weeks through five years of age. Preschool and Pre-K options are available as well as drop-in care, respite care, and hourly care. Waiting lists may apply-as soon as orders are available, incoming troops are advised to visit www.militarychildcare.com to register for CDC care or other options including Child Development Homes in regulated, private on-base housing by qualified providers. Call the Oceana CDC at 757-433-3164 or Military Child Care at 855-696-2934 to learn more about child care options on and off the Naval Air Station. All new arrivals are directed to track and manage their household goods shipments using the Defense Personal Property System at Move.mil. The Norfolk Personal Property Shipping Office serves all military services in the region including NAS Oceana and further assistance is available by calling 757-443-3700. There is no personal property office aboard NAS Oceana. All ID card services are provided by PSD Oceana and scheduled via RAPIDS or by calling (757) 433-2184. Multiple ID card services including CAC, dependent ID, retiree ID cards, or replacement/renewal cards for active duty military must be scheduled with multiple back-to-back appointments. Prior school report cards where applicable. The Hampton Roads area has a large number of military bases, and these communities (including NAS Oceana) are served by what is called PPV Housing. PPV stands for Public Private Venture and family housing units under this program are available via a waiting list. Contact the Housing Service Center to sign up for the waiting list once orders are available. All military personnel are ordered to report to the Housing Service Center, before committing to any lease or rental agreement. The length of housing waiting lists for military housing depend on rank, date of application and required housing size. Unaccompanied military members between the ranks of E-1 thru E-4 are housed on-base in barracks and may be added to a housing waiting list for private housing once the on-base occupancy rate reaches a certain capacity. Those ranking E-4 and above will receive BAH and reside in the local community. All new arrivals will contact their unit orderly rooms to learn about any additional requirements for government and local economy housing. When traveling, it is important to remember that rules and requirements will vary depending on the temporary lodging facility. For example, pets are not allowed in certain Hampton Roads area Navy Lodges; the Navy Lodges at NAB Little Creek & NS Norfolk have some limited accommodation for pets. There are commercial transportation services available for new arrivals flying into Norfolk International Airport, and depending on mission requirements and other variables students on TDY orders for training may be picked up by a shuttle arranged by the NAS Oceana training school. This may not always be available so it’s best to make prior arrangements or ask what transportation to the air station is best. Those driving rental cars to the air station must show the rental agreement and provide evidence of all required insurance coverages where applicable. The NAS Oceana official site states that while base decals may no longer be required, all privately owned vehicles must still be registered on base and parking passes are required to be displayed at all times. The Pass and Decal Office (Bldg. 252) requires all vehicle registrations to be accompanied by proof of vehicle ownership such as a car title, state registration, or a “notarized statement giving you permission to drive the vehicle”. Current insurance is required and vehicles registered in the state must also have proof of compliance with local emissions requirements. Use of cell phones, texting while driving, and other concerns are subject to base regulation and state law. NAS Oceana has a car booster seat policy for all children up to the age of eight years of age; all passengers eight or younger must be in a booster seat in the back seat or in the front seat only if the airbag has been disabled.